Vancouver is spoiled for choice when it comes to skiing and snowboarding in the city. Look no further than the North Shore mountains and the three – three! – hills which boast dozens of runs for every level. But one of the best things about visiting Vancouver over ski season is the proximity of these hills to downtown, which leaves plenty of time in the day or evening to enjoy an apres activity perfectly paired to a day on the slopes. Whether you’re looking to fuel back up, soak sore muscles or keep the good times rolling, there’s a post-ski (or snowboard) spot for everyone. 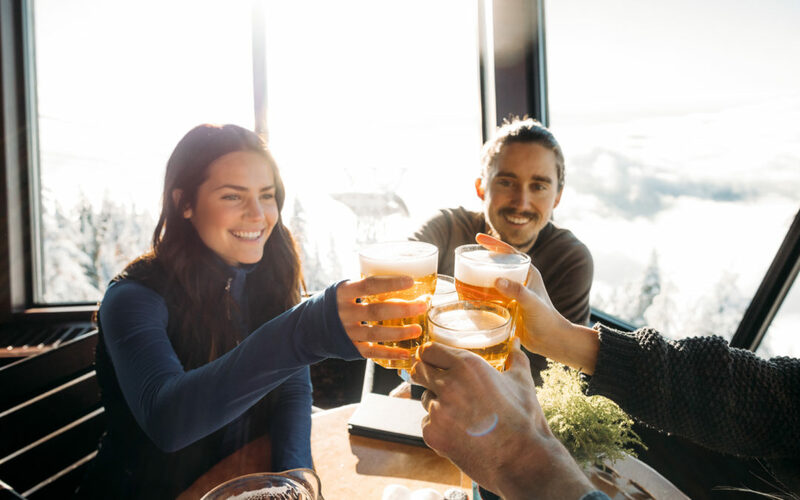 This is a cult-classic activity for ski-bunnies and bros. A plate of nachos and a brew or two to recharge after a day on the slopes. St. Augustine’s on Commercial Drive (a nice halfway point between the North Shore mountains and The Burrard) has the perfect recipe for a hearty après meal. 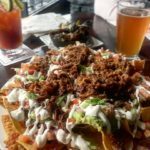 The casual brewpub has over 60 different beers on tap with many coming from local breweries along with the usual suspects on the menu – burgers, pizza, and nachos. However, only locals know the reason why St. Augustine’s is the spot for nachos. And yeah, guac is included. Snuggle up by the fire at The Keg Steakhouse, with the bonus of chowing down on a plate packed with protein. Known for its steak and side dishes, The Keg also offers a warm fireplace to cozy up at. The heated and covered rooftop patio at their Yaletown location offers views of the city while you warm up. Of course, there’s another fireplace located much closer to home – the one in our inner courtyard. Grab a blanket and curl up at our place. It’s the perfect spot to unwind and the commute to your room is mere steps. If sore muscles require a nice, hot soak then look no further than our neighbour down the street, the Robert Lee YMCA. 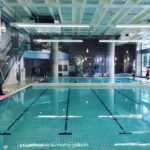 Open to everyone, the facility features a pool, sauna, steam room, and that all-important hot tub. The perfect reliever for the aches and pains that can follow a day shredding powder. If you’ve spent the day on the mountains, consider visiting later in the evening for a quieter and more relaxed atmosphere. The pool closes at 10:30 pm so no need to rush. The facility also includes a state-of-the-art gym and yoga studio if you’re looking for a spot to stretch. 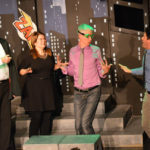 They say laughter is the best medicine, so along with an ibuprofen for what will likely be some sore muscles, you might want to take in an evening of comedy at Vancouver TheatreSports League. Take your friends from the slopes to the stage as you enjoy an evening of fun and games that promises to have you rolling with laughter. With alumni like Colin Mochrie of Who’s Line Is It Anyway fame, the players here have world-class talent. From seasonal shows to pop-culture parodies, performances are guaranteed to tickle your funny-bone. 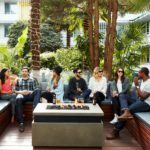 As a bonus: the venue is located on Granville Island, home to some great craft beers and a cozy Keg fireplace so you can enjoy more than one of our recommended activities. With adrenaline running high after breathtaking views on mountain runs, ground yourself with a yoga class. Restorative yoga in particular is a beginner level style of yoga designed to rejuvenate and relax both the mind and body. With a number of studios downtown, including YYoga just down the road from The Burrard, it’s quick and easy to take part in the most quintessential of west coast pairings: going from powder to pigeon pose in the same day. Of course, the perfect way to après is spending the night in one of our comfy, cozy rooms. Visit our booking page for great rates no matter the season.